The Mercer University Online MBA at the Stetson School of Business is offered in a flexible format that can accommodate its students’ busy work and personal lives. Students in this program have the ability to earn an MBA in only 18 months. The same faculty members who teach in Mercer’s on-campus MBA programs also teach in Mercer’s online MBA program. As part of the online MBA program, students can also physically attend some on-campus classes if they wish. 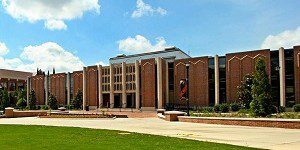 The Mercer University Online MBA consists of 36 to 45 credit hours. Students begin the program with foundation courses that require up to nine credit hours, and can be waived if the student has successfully completed equivalent classes. There are 21 credit hours of core program courses that must be completed in areas including economics, accounting, business law and corporate responsibility, management information systems, marketing, finance, operations management, and ethical leadership. Students can also pick a specialization area.. This requires 12 credit hours. Tracts include marketing, finance, economics, general business, human resources and healthcare management. Students must complete the MBA capstone, worth 3 credit hours. The capstone is typically the last class taken in the program and allows students to practice that skills they have learned with a hands-on project. The average student enrolled in Mercer’s Online MBA is 28-years old and has five years of work experience. Students also are usually working and have other commitments that make attending a traditional MBA program difficult. For Mercer Online MBA students, tuition costs $755 per credit hour. With a total of 36 credits, tuition for the entire program costs $27,180. Additional costs include a technology fee. A reduced tuition rate of $2,500 is given to the Business Foundations module. Students at Mercer can visit the university’s Office of Student Financial Planning to receive updated financial assistance information, including information on federal student loan programs. Applicants to the Online MBA programs must have completed a four-year degree or its equivalent for admissions. Applicants must complete the online application and submit a current résumé, official GMAT scores, and official transcript(s) from each college or university attended. A nonrefundable $50 application fee is required.